June 10, 2012 - The International Air Transport Association (IATA) announced that the 68th IATA Annual General Meeting (AGM) and World Air Transport Summit will open in Beijing, China on Monday 11 June 2012. The event will bring together some 650 leaders of the global aviation industry for two days of intense discussions on the industry’s most important issues. “Oil prices are high, although moderating somewhat from recent peaks. The European sovereign debt crisis is unresolved and we are seeing signs that it is starting to affect Asia’s export-driven economies. And the largely jobless recovery from the 2008 global financial crisis is proceeding at a glacial pace. Passenger demand is strong, cargo is weak and the industry’s profitability remains razor thin,” said Tony Tyler, IATA’s Director General and CEO. In March, IATA announced its industry outlook for a $3.0 billion profit on $633 billion in revenues for a net margin of 0.5%. On Monday, the association will revise the outlook taking into consideration the volatility over recent months. Two panel discussions will highlight the opening day’s activities, the CEO Forum will feature: Akbar Al Baker, Qatar Airways; Piyasvasti Amranand, Thai Airways; Bronwyn Curtis, HSBC; Alex Dichter, McKinsey & Company; Alan Joyce, Qantas Airways and John Slosar, Cathay Pacific Airways. Doing Business in China will feature: Tim Clissold, Peony Capital; Liu Shaoyong, China Eastern Airlines; Christian Murck; American Chamber of Commerce in the People’s Republic of China and Helen Wong, HSBC Bank (China). Tuesday 12 June will offer four discussions: Social Media and Air Transport, Value of Aviation, Commercialization of Biofuels and the Future of Airline Distribution. One-half of the industry’s aggregate profits in 2011 were earned by Chinese airlines and three of the world’s 10 largest IATA member airlines by passengers are based there. China is the second largest airline market in the world with 300 million travelers and industry revenues of $57.6 billion last year. To support further growth, it is in the process of adding 70 new airports between 2011 and 2015 with 97 airports to be built by 2020. IATA has a long and fruitful history of partnership in the development of aviation in China. IATA first established a presence in the Mainland of China in 1994. Currently, 19 Chinese airlines are counted among IATA’s 242 members, of which 11 are based in the Mainland of China. Additionally, one of the country’s most popular air routes for international flights is unofficially known as IATA-1, owing to the Association’s close cooperation with the Chinese authorities in establishing it. China was also the first country to achieve IATA’s mandate of 100% e-ticketing for its airlines. Air China is hosting the event. This is the second time that the AGM will be held in China. 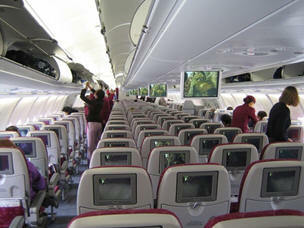 The first was in 2002 in Shanghai at the invitation of China Eastern Airlines. IATA (International Air Transport Association) represents some 240 airlines comprising 84% of global air traffic.